Opaque watercolor tempera in studio cake size. Color cakes are instantly responsive to a wet brush. 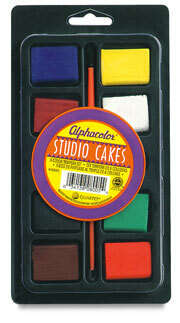 Eight-cake set is packaged in a molded plastic palette tray with lid and watercolor brush.